The new X8 braid from Sufix is an 8-carrier braid constructed of thin HMPE Japanese fibres. It’s a super strong, thin braided line that has high abrasion resistance and superb knot and shock strength. This soft and silky smooth line has low friction through the rod guides, resulting in silent performance and long, accurate casts. R8 precision braiding technology with a high tension weaving process results in a round, supple and smooth braided line with consistent diameter and quality. Easy handling, X8 is designed for both casting and spinning reels. Currently available in an eye-catching hot yellow, it comes in breaking strains from 6lb to 50lb in 150yd spools and 10lb to 65lb in 300yd lengths. 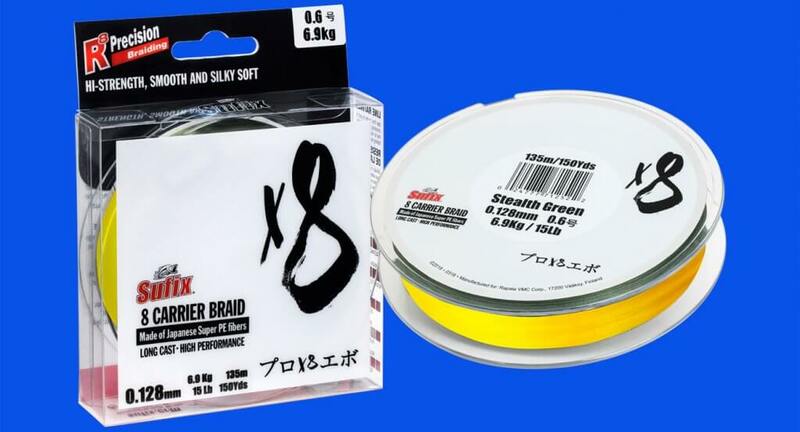 Sufix X8 braid will be on sale in all leading tackle stores from September 2018.